BIG NEWS! My new cookbook is now out! But before you buy a copy, enter to win one — for FREE! 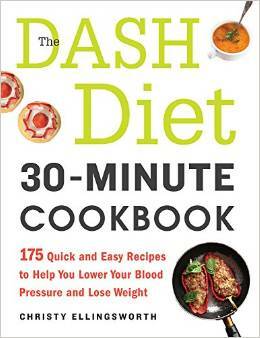 The DASH Diet 30-Minute Cookbook is packed with 175 flavorful, easy-to-make recipes, table-ready in 30 minutes or less. It features step-by-step instructions, prep and cooking times, complete nutritional information, and more. The #1 doctor-prescribed diet in the United States, the DASH (Dietary Approaches to Stop Hypertension) diet is one of the healthiest ways to lose weight, lower blood pressure, and curb diabetes risk, all without the use of medications. You can change your life, literally, with each and every meal. To celebrate the release of The DASH Diet 30-Minute Cookbook, my publisher Adams Media is kindly offering five (5) free copies to Daily Dish readers. To enter, simply leave a comment below letting me know you’d like to win! Entries will be taken through Saturday, June 20th, and the five lucky winners will be announced here and on Facebook on Sunday. One entry per person, no residency restrictions apply. This entry was posted in From the Kitchen, Promotional Giveaway and tagged free giveaway!, The DASH Diet 30-Minute Cookbook. Bookmark the permalink. 102 Responses to The DASH Diet 30-Minute Cookbook GIVEAWAY!! I love all of your recipes. I would LOVE to win. Would appreciate winning a cookbook. Your blog was the first one I found when I was diagnosed with Meniere’s Disease and had to slash my sodium intake. Sounds corny, but reading your story and your recipes made me think maybe my food might taste good again. How much fun would that be to win your book! Would love to have your new cookbook!! I love your recipe’s and I suffer from CHF, so this book would really really help me. My health requires me to live more or less by your sodium free recipes. This would be a great boon for my health. I would love to win, but will purchase if not. Bought your first cookbook. This would be a great addition! I would love to win your new cookbook, as your recipes have been very helpful to me. Last Thanksgiving was my first after being diagnosed with the infamous random ear ailment, Meniere’s Disease. Your low sodium recipes were great, and I would love to try more of them. Thanks! What a great giveaway! I’d love to win a copy. I think Knowing Dishy is the biggest win! But I’d love to have her new cook book in my house! Pick me! pick me! pick me! Congrats on the cookbook – can’t wait to read it! I love getting your recipes via email! I try to cut down on my salt, and you really help make that possible and flavorful! IIV would love to win. Oh how I would LOVE to win a copy! You have been an inspiration and blessing to my world! Looking forward to this book! Would love to win your cookbook. I have been living low sodium for two years due to CHF. Am in better health now than I have been in many years. I love to cook and am always looking for new ideas. I have had menieres for 10 years and have finally found comfort with your blog and recipes. Thank you for sharing with fellow sufferers! I’d love to win because I enjoy the blog and want to try out the recipes! I would love to win your cookbook. My fiance recently underwent Quad Bypass Surgery (3 1/2 weeks ago) and I am now faced with the daunting task of finding low sodium meals that he will eat!!! PLEASE PLEASE PLEASE, I desperately need to win your Cookbook!!! Did I say PLEASE?????? and Thank you for writing it! I would love to win the cookbook! I would love to win, I always have a hard time finding low sodium recipes. I’m on the go a lot, so quick DASH meals are important to me…I need a copy of this book! I would like a copy please !! I had to go salt-free about 4 years ago and have found tasty meals a challenge. I cannot make the recipes I used to make because of the constant comparison between salted and non-salted version, so it has been all new recipes since then. I good salt-free cookbook would be a great help! I love your recipes and have found that I can make some things without salt that are mighty tasty indeed. My daughter and I spent a wonderful afternoon making salt-free Italian sausage, and it was wonderful ! Thank you for a great website. My blood pressure hardly tolerates any salt, so I have enjoyed reading this site. It does give me great ideas for my food. I would love to win a cookbook. My dear friend suffers Menieres Disease and suffers terribly. I would love to win and give to her as a gift. Anything to help my friend. Thank you for the opportunity. My husband recently underwent a heart procedure where two arteries (one 90% occluded and the other at 60%) were angioplastied (sp!) and now have stints. He is doing fabulous but now is also on a low sodium eating plan. We’d love to win a copy of your new book. Thanks for all the great recipes!! Of course who wouldn’t want to WIN a fabulous collection of Dishy’s best recipes!!!! I would LOVE to win!!! Thank you for taking the time to put your great ideas and recipes in print! Looks like a great book. Would love to use it on my journey focused on a heart healthy lifestyle. Pick me please and make this old lady happy. The worst part of needing to make low sodium foods for my husband is the time needed to prepare so many dishes from scratch. I would love to find more quick recipes. You saved my life! After being diagnosed with Ménière’s this time last year, I stumbled upon your website, read your story, tried your recipes, and entered my low sodium journey. My family appreciates you too. Wow- your recipes are tasty! You have inspired me to adjust my own recipes to make them loso. The cookbook I bought last year is already falling apart. I would love to win a copy. I would love to win this book. I need all the help I can get to keep my sodium down. Thank you for offering it. I’d love to win this. Healthy eating is so yummy. I have Meniere’s Disease and would LOVE this cookbook!!!!!!!!!!!!!!!!!!!!!!!!!!! My wife and best friend suffered a massive stroke recently and now I am her caregiver and cook here at home. Her blood pressure runs dangerously high at times and so I have to come up with low sodium dishes for us that somehow have enough flavor to make meals interesting for her. I’ve been largely unsuccessful in the flavor dept. so far, so am looking forward to trying some recipes in your upcoming book and on your website. Thanks for the chance to win your book! We are learning to eat low sodium. Your cookbook would be such a big help. Congratulations on the publication of your book. I would love to win a copy. Your cookbook sounds awesome and very helpful!! Congrats on your new book, how exciting! I love your recipes and would love to win a copy of your book! I love your cookbook! It’s been a huge help to me with my Mèniéres. I was having a hard time cooking with almost no sodium and your book and blog have literally opened me up to how to really taste food. I’m so excited you’ve made another cookbook!! Regardless of the free copy results I will have one! Thanks for sharing your story and inspiring me to help heal my body with food. My husband truly needs these recipes! I’d be DELIGHTED to win! I have Meniere’s Disease & was just recently diagnosed with Pulmonary Hypertension. Based on comments and reviews, I need this. Thanks bunches! Love your recipes….can’t have salt, garlic, ginger and many other high Salicylatic foods due to HHT. I would love to have a printed version of your cookbook. Thanks for the recipes. I recently was diagnosed with Congestive Heart Failure and A-FIB. I need your book to learn more about being healthy. I want to live. Looking forward to seeing the new cookbook! Please add me to the drawing. I’d love to win your cookbook! Congratulations on this fantastic publication! As a newbee to the no salt experience and I am ravenous for good, yet simple, recipes. It would be exciting to win your book. I would love to win your cookbook. I am one year in of being diagnosed with Meneire’s. Last summer was a big struggle and I couldn’t drive or leave the house by myself. I would have terrible vertigo attacks and all I could do was sit. I wasn’t certain about the future. I eventually found a good doctor, got on the right medicine prescription for me, and cut out caffiene, alcohol, and salt. I finally feel like myself again. Your blog was the first positive site I found. All the other information out there just scared me more. I have been using your recipes, especially the salsa, dressings, and dips. Your encouraging words gave me confidence to cook without the salt. I am already a winner finding your blog! Your blog and recipes gave me hope when I thought there was none. Your book would be would have pride of place amongst my recipes. Many thanks! I would love to win the book. Great recipes that I’m very anxious to try. Hoping that it will help blood pressure. I would love to win a copy of the book! We’d starve without your recipes. Would love to have your new cookbook. Your first cookbook is great. Would love to win this one! hi, I would love to win your cookbook !! I am starting to have blood pressure and just want me and my kids to eat healthier !! with the book can get recipes for reducing blod pressure !! I need to lower my blood pressure and have been instructed to reduce my salt intake. I know your cookbook would be a great resource! I would LOVE a copy of The DASH Diet! I’d love to win your recipe book! Congrats on your book! Eating healthy and quick preparation is so omportant!! I have your first cook book and use it all the time, it gave me hope when i was diagnosed with Meniere’s, hope that I could eat tasty food again and that it’s not too hard to achieve results. I love to cook but remember thinking when i was diagnosed “oh my god, what can i eat?” and you have given me inspiration both in your book and also your blog & website, I love seeing that I have a new email from you. So yes, I would love to win your new cookbook. I would love to have a copy of this cookbook..either by winning or purchase! Christy, I, too, would love to win a copy of your new book. My significant other and I are struggling to reduce his blood pressure. For two years he has been suffering from membranous nephropathy which is an autoimmune disorder that attacks the kidneys. It causes many issues, one of which is blood pressure. It has been quite high. After just one week of cutting sodium WAY back, his blood pressure has gone down over 20 points! Each day, we have experimented with a different dish of yours. Our favorite so far is the pasta, spinach, and tomatoes, but we like many! Thank you, Christy! I would love to enter and win. Your website has helped me with my life style change this year since I’ve had 2 heart attacks. Thank you so much. This would be a great book to win. I have been following your blog and emails since being diagnosed with Menieres Disease in 2011. Living in Australia, some ingredients are not found here – we have a lot less choice, but I adapt your recipes. I would love to win a book. We are so proud and happy for you! I miss living a few houses from you and getting to try all your scrumptious recipes! Wishing you much love and success with the book!! I would love a couple of your New Cookbook!!! this sounds like a great book. thanks for the giveaway! COOKBOOK REASON: 25 years of my wife’s Menieres Disease I’m hoping a more closely monitored low salt strategy will help my wife’s active vertigo symptoms and put this illness back into remission for good! Thanks for offering this giveaway Christy. My new husband of four weeks had a heart attack 8 weeks ago. I am frantically learning all that I can about low/no-sodium cooking and am making everything from scratch. He has cardiac failure and the only way for him to get better is to watch liquid intake and sodium intake. I could really use the help of a good cookbook! Congratulations on your new book. Would love to check it out! I would really love a copy of your book! I discovered your blog through today’s VEDA posting. My mom is suffering from recently diagnosed Menieres Disease, and I also have a vestibular disorder since last year (I am 24 years old). She was hospitalized recently from a severe vertigo and sickness attack, and has been very unwell since. It has occurred on a yearly basis for 5 years, but she has never been this ill…Her birthday is tomorrow, June 20th. Thank you so much for being a voice in the MD community. Your work, effort, and health matters to all of us. I hope you have been a little better. Much success to your book! God bless! I would love to win this cookbook. Thanks for the opportunity. I would love to win your cookbook. I have congestive heart failure and my sodium is restricted to 500 mg. per day. Your recipes have helped me adapt to my new lifestyle. Would be fantastic to have the entire book to enjoy more of them! Thanks for the great recipes! I have had Meniere’s for 5 years and probably use one of your recipes every week. Please include me in the giveaway! My fiancé had a heart attack 3 months ago, so we’ve been faced with the task of changing our lifestyles and becoming low sodium. It’s getting easier, but still could use any and all the help we could get. I’d love to have this cookbook! CHF survivor and type 2 diabetic here… Would really love to have a copy of this cookbook. I would love to win a copy as I need help eating better and especially low sodium or sodium free. Happy Father’s Day! Wishing the best to all the hard-working dads and dads-in-spirit. Congrats! Please look for an email from me; I will need your addresses ASAP. For those who didn’t win a book, I will be selling signed copies this week on the Daily Dish. All sales go directly towards supporting the site. Post about it tomorrow! What a great sounding cookbook. I’d love to win it.